Trigger points are knots that form due to overactive muscles. Many active trigger points may be relieved through the use of physical therapy. 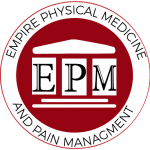 If you are experiencing pain coinciding from consistently active trigger points, however, then a trigger point injection would be an effective modality to rid you of your pain. Administered by a doctor, a small needle is inserted into the trigger point area. The injection may contain normal saline or some type of local anesthetic to numb the area such as lidocaine. At times, it may include a corticosteroid as well. Numbing medication is administered to ensure maximum comfort during treatment. The needle will gently move throughout the area to ensure the entire area is treated and is extracted once the muscle is relaxed, or the local twitch response halts. Viscosupplementation is a procedure used to treat knee osteoarthritis. The goal of this procedure is to make it easier for your bones to move over each other and to help with your joint’s ability to absorb shock. This is achieved by adding hyaluronic acid, a natural substance which can be found in the synovial fluid of our joints, to the knee joint Studies have shown that those suffering from osteoarthritis have a smaller concentration of synovial fluid in their joints. For those suffering from arthritis of the knee, viscosupplementation would be an effective treatment option to reduce your pain. Typically, treatments are administered on a weekly basis over a three to five week span. Depending on the source of the pain, the utmost accuracy may be required. The structure of the pain source may sometimes be only a couple millimeters and it is best to not interfere with the surrounding structures. In this case, we offer ultrasound guided joint injections, which provide for a more precise needle placement. The ultrasound machine displays the area of pain in real time imaging. With this, we can then ensure we guide the needle with pin-point accuracy. We can provide these injections for a variety of conditions, from knee inflammation to shoulder tendinitis. After receiving these injections, most patients will feel relief for weeks or, in some cases, months. Stretching and proper exercise remain an integral part of the healing process after receiving such treatment and also helps with future prevention.